Hello my lovely readers!!! I am very delighted to announce my first blogging event. It’s been six months since I started this blog and participated in many blogging events, which inspired me to start an event. This is monthly event with a different concept for each month. And the roundup will be posted the coming month’s 1st week. 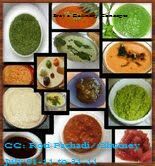 So this month’s Cooking Concept is “Roti Pachadi/Chutney”. Before proceeding, let me tell you about the word Roti pachadi ---Pachadi means Chutney which is a traditional Indian side dish and it refers to the food which has been minced. Roti is Indian mortar (Rolu ) in which this chutney is made. Any chutney will taste delicious if we make it by using this mortar But in US we get them very rarely and so I use blender to make these Pachadi. Chutney is a dipping sauce or a fresh pickle and has very low shelf life, a maximum of one week. These are usually prepared by fresh vegetables or the peel of the vegetable can be used and is served as an accompaniment for rice, snacks like idli, dosa, vadas and so on. Gongura pachadi and coconut pachadi are my favorite, I am sure there are endless numbers of other varieties. So why waiting friends send me as many recipes as you can. Any number of entries are allowed, archives are also allowed if reposted and update with the link to the announcement page. Last date for the entries is July 31st 2011. Hope to see you all participating!!! lovely event ..will rush in my entries..happy hosting,dear!! Nice event dear.. Happy hosting !! Lovely event .. happy hosting. Nice event. Happy hoasting. Surely send my entries. I've a ongoing event calender at my blog...you can add this event there. Lovely theme and I wish a great success. Best wishes for your first event. I have sent one entry and will send more soon. Nice event Sravani, I will send my entries soon, happy hosting dear!! Nice concept and happy hosting!! Great event, love the theme. Happy hosting. So, does the chutney have to prepared in mortar to qualify? Great! Will send my entry soon. Nice concept sravs. Bought a newone last month. had to keep it in packing due to shifting. So happy to put it to use now. Nice event Srav! Will sure send my entry. Love chutneys or dipping sauces. This sounds like a scrumptious event. Can't wait to see all the yummy chutney ideas! Lovely concept dear.. will send my entries soon:) Happy hosting..
Nice event. will send my entries soon. Have sent in my entries ..
i just posted my entry shrav's plz check it out! Best of luck for starting the event, nice concept. thnX for the invite dear, i'm sending my second entry- gongura pacchadi. i suggestin dear, right click in disfunctioned in your blog tht's y i can't place ur logo on my blog.